Welcome to the 16th Month of Math Software where I take a tour around the news and new releases in the world of mathematical software. Thanks so much to this month’s contributors without whom I would really struggle to put this newsletter together. As always, the archives can be found at http://www.walkingrandomly.com/?cat=47 and if you have any news for next month then there are numerous ways in which to contact me. The world of Open Source mathematical software stands to gain heavily from this year’s Google Summer of Code. Projects include an attempt to port Scilab to Android, improvements to symbolic expressions in Sage, aerospace and signal processing blocksets for Xcos, Just In Time compilation for Octave and many many more. See http://www.google-melange.com/gsoc/projects/list/google/gsoc2012 for the full list of projects. 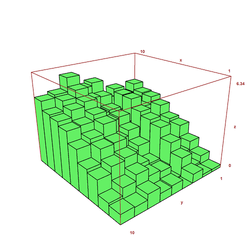 An OpenCL implementation of the GPU linear algebra library, MAGMA, has been released. The practical upshot of this is that you can use GPU cards from manufacturers other than NVIDIA now. Version 0.1 Beta includes implementations of LU, QR, and Cholesky matrix factorisations. A beta version of AMD’s Accelerated Parallel Processing Math Libraries has been released.Version 1.7 beta includes some new BLAS Level 2 and 3 functions and is required for the MAGMA release mentioned above. GPU Systems have released version 2.0 of their Libra SDK. According to the website ‘Libra is a cross processor, cross platform, cross language – standard math library and runtime API – for software application development.’ It supports both OpenCL and CUDA and multiple languages including C, C++, Java, C# and MATLAB. Benchmarking the new Kepler GTX680 – AccelerEyes compares NVIDIA’s new hardware with its old. 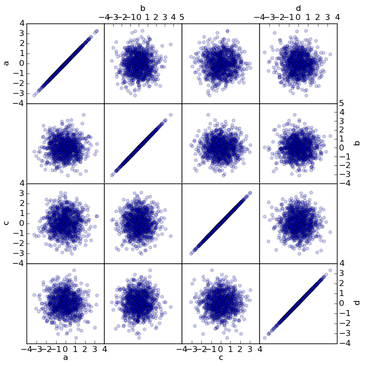 The benchmarks are Matrix-Matrix Multiply, Fast Fourier Transform and sorting. Version 0.7.3 of Pandas has been released. According to the website, Pandas aims to become the most powerful and flexible open source data analysis / manipulation tool available in any language Go to http://pandas.pydata.org/pandas-docs/dev/whatsnew.html to see what’s new. Version 0.4 of mathics has been released. ‘Mathics is a free, general-purpose online computer algebra system featuring Mathematica-compatible syntax and functions.’ The Mathics project is looking for more developers, contact Jan Pöschko if you’re interested. PaStiX (http://pastix.gforge.inria.fr) is a scientific library that provides a high performance parallel solver for very large sparse linear systems based on direct methods and version 5.2 was released this month. According to this blog, SPSS is in steep decline with the open source language, R, taking up the slack. This blog, however, isn’t so sure! A MATLAB user at Manchester recently sent me some code and data as part of a Condor support request but Outlook helpfully blocked access to his .mat files deeming them potentially unsafe! It seems that Microsoft Outlook is afraid of matrices. I guess that the easiest way to proceed would be to ask him to resend his stuff as a .zip file but that would slow down the support query. I just wanted to stop Outlook being quite so paranoid and let me have access to those scary matrices. The fix is a registry edit (very user-friendly of Microsoft right?) so please don’t proceed if you are not comfortable editing the registry. The registry controls numerous aspects of the Windows operating system along with many of the applications you have installed. If it had a map then there would be huge areas labelled ‘Here be Dragons.’ Corrupting the registry could lead to an unusable operating system. So, the following is offered without warranty on a ‘it works for me’ basis. 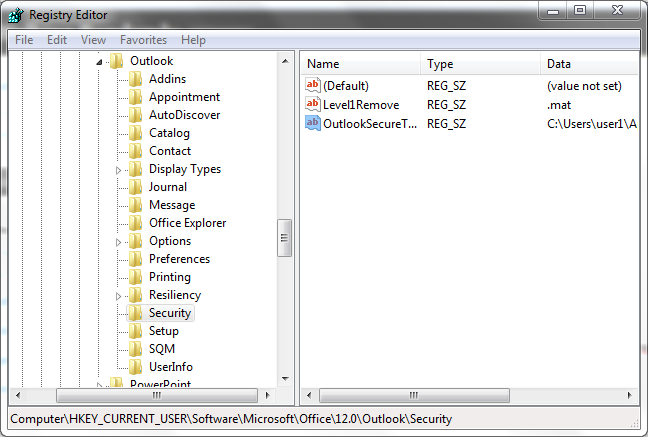 Open up regedit and navigate to the following (I’m using Windows 7 and Outlook 2007, location and procedure may be different for different environments). Thanks to The Mathworks technical support team for this information. 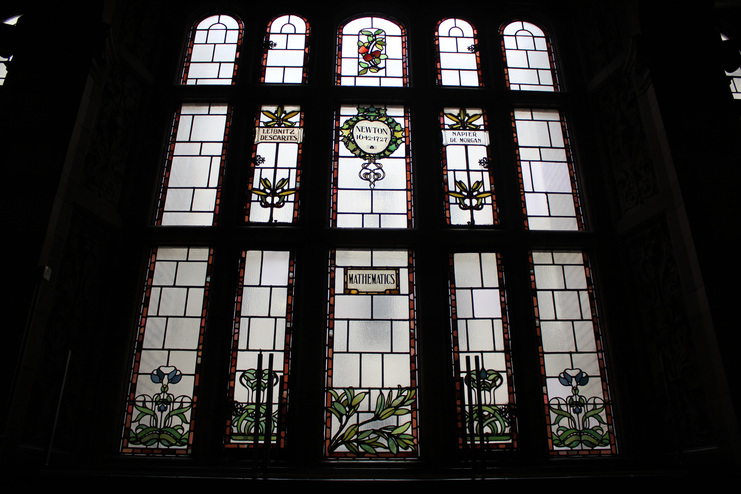 I work in a beautiful old building at The University of Manchester called The Sackville Street Building. Yesterday, I took part in a very interesting historical tour of the building and was astonished at the amount of beautiful things that I had never noticed before and yet walk past every day. While on the tour I posted a quick snap of the above window to twitter using my mobile phone and received some nice feedback along with a few pictures of other mathematical windows. It turns out that Manchester’s Nick Higham has a close up of the above window for example. 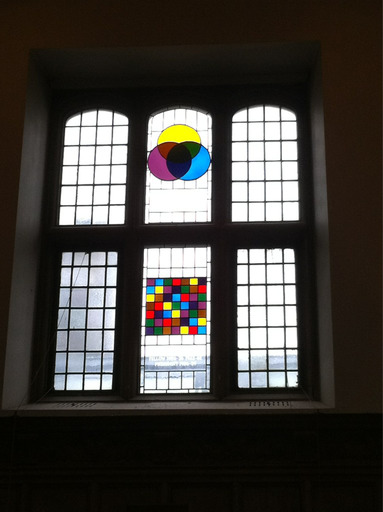 Also, Kit Yates tweeted about several mathematical windows in Caius College, Cambridge, one of which is below (showing images related to Venn and Fisher). Do you know of any other examples of mathematics in stained glass? Feel free to contact me and tell me all about it. I recently installed MATLAB 2012a on a Windows machine along with a certain set of standard Mathworks toolboxes. In addition, I also installed the excellent NAG Toolbox for MATLAB which is standard practice at my University. Near the end and it seems that the MATLAB installer really doesn’t like this. So, what you do is create a copy of this pathdef.m file (pathdef.m.old for example) and then remove the non-mathworks lines in pathdef.m. Now you can install the extra Mathworks toolboxes you want. Once the installer has finished its work you can re-add the non-mathworks lines back into pathdef.m using your copy as a guide. I’ll be informing both NAG and The Mathworks about this particular issue but wanted to get this post out there as soon as possible to provide a workaround since at least one other person has hit this problem at my University and I doubt that he will be the last (It’s also going to make SCCM deployment of MATLAB a pain but that’s another story). The Mathworks installer is unhappy about the missing comma. Welcome to this month’s MMS which includes the usual mix of commercial and open source software spanning across multiple disciplines. Last month’s edition is here and the archive of all previous editions is at http://www.walkingrandomly.com/?cat=47. Thanks so much for all of the contributors this month without whom these articles would be significantly more difficult to write. As always, if you have some mathematical software news then feel free to contact me. Maple 16 was released in March and according to Maplesoft it has over 4500 additions and improvements compared to the previous version. Maple is very strong in polynomial arithmetic and Maplesoft have released benchmarks showing how Maple 16 is hundreds of times faster than Mathematica 8 in this area. For example, multiplication of two dense polynomials in 3 variables, each of degree 30 takes 110 seconds in Mathematica 8 but only 0.52 seconds in Maple 16 according to these new benchmarks. MATLAB version 2012a was also released in March with the usual batch of improvements and updates. One of the highlights for me is the fact that The Mathworks now offer the MATLAB Compiler Runtime for free download, significantly simplifying the deployment of compiled applications. Gnumeric is a free spreadsheet program and is part of the GNOME Office suite. Version 1..11.2 was released in March – see http://projects.gnome.org/gnumeric/announcements/1.11/gnumeric-1.11.2.shtml for the details. Euler Math Toolbox has moved from its old sourceforge home to http://euler.rene-grothmann.de. Now at version 14.5, this free MATLAB-like application has lots of nice features; read about all the new ones since version 14 here. The Python Data Analysis library, pandas, is designed to help Python programmers perform in depth data analysis projects without having to resort to R. Version 0.7.2 was released in March and you can see what’s new at http://pandas.pydata.org/pandas-docs/dev/whatsnew.html. Thanks to Tom Brander for the heads up on this one. The open-source statistical juggernaut that is R has been updated to version 2.15.0. R-bloggers.com has got a copy of the release notes. The FEniCS book has been published and is available online and in print. The online version is available at http://dx.doi.org/10.1007/978-3-642-23099-8 and hard copies can be ordered from Springer (http://tinyurl.com/3ueq9hk) or book sellers. The FEniCS Project is a collection of free software with an extensive list of features for automated, efficient solution of differential equations. The following two packages were recently announced on the Numerical Analysis Digest.